“Her Viking Heart” by Heidi Herman is a compelling story about love, loss, betrayal and redemption, as one woman discovers a family secret that changes everything she’s ever known. When Anna Miller’s father is killed less than two years after the death of her mother, Anna finds herself alone in the world. Moving back into her family home, Anna has the arduous task of sorting through and packing up her parents’ belongings. When she comes across some mysterious documents in her father’s study she is confused but intrigued. Determined to complete the research her father began, Anna embarks on a journey that will take her back several generations in history to WWII. As she begins to unveil the mystery surrounding her family, her research takes her to a small town in Wyoming. It is in this town she meets a handsome rancher named Logan Harris, awakening feelings that haven’t stirred inside her in a long time. As Anna gets closer to discovering the truth about her family secrets, she realizes it may be at the cost of her personal happiness. It’s been some time since I’ve read such an enchanting story. The plotline, the settings, the characters – I found all the elements to be equally satisfying. It is a well-balanced narrative with plenty of developments that move the story continually forward, with enough surprise turns building anticipation and just the right amount of drama, romance, and intrigue to keep readers engaged. The characters are easy to relate to and feel genuine in their roles and situations. I experienced an immediate pull towards Anna – her emotions jumping off the pages as she is forced to deal with issues one cannot even imagine unless they’ve been in those shoes. Her personality brought out the mama bear instinct in me as I vacillated between wanting to give her that kind of hug only a mother can give and wanting to take over and fix things for her! Not that she needed anyone to fix anything for her. Capable, resilient and strong, I thoroughly enjoyed investing in Anna, standing in her corner and rooting her on as she unraveled the mystery. I especially delighted in watching her evolve throughout the story, as she reevaluated the things that were important in her life. 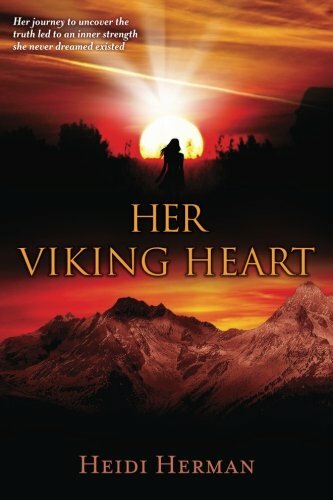 “Her Viking Heart” is the first story I’ve read by Heidi Herman, but it won’t be the last. She is a natural storyteller easily transporting the reader to another time and place. This was such a fun read, and I highly recommend it to fans of contemporary fiction with elements of subtle romance, a good mystery to solve and enough twists and turns to keep readers on their toes.